Colorado’s food culture has come a long way. Today, it’s a melting pot, a product of exponential growth in population over the years. What’s astounded me while working at an organization that supports good, clean, and fair local food, is that not many people have explored some of the early pioneers of Colorado cuisine. Although the Pueblo, Kiowa, Cheyenne, and Arapaho tribes historically occupied Colorado land with a food culture of their own (like using creekside chokecherries for pemmican), the Pike’s Peak Gold Rush (1858-1860) brought families from the eastern U.S. to explore and settle into the nooks and crannies of its rushing streams, vast plains, and eye-drawing Rocky ranges. Some of the earlier accounts of gold discovery in Colorado describe very scarce supplies and food sources, with packs and covered wagons/wind wagons being stuffed with “bedding, bread, and a copy of Emerson’s Essays” (Brown, 8). As word got out and the Pike’s Peak Gold Rush began to unfold, miners-to-be headed for the mountain stream sides to set up camp throughout the mild winter of 1858 and into the spring of 1859. But the promise of gold didn’t come without sacrifices. Thousands of men (and a few progressive women) left the comforts of their homes back east, and traversed steep and rugged conditions with minimal supplies in wagons and lots of times on foot. It was pretty brutal; many of these travelers didn’t even survive the journey. The nights could get wicked cold, and unexpected blasts of wintry temperatures could kill migrators quickly in their most vulnerable of states. Several letters and documents dating back to the time of the Colorado Gold Rush note that the journey to the Denver City area was one of starvation (or–believe it or not–sometimes cannibalism), scurvy, dehydration, and whiskey–to drown out doubt and fear. Prior to the creation of the railroad, the Smoky Hill and Santa Fe Trails were among some of the most popular routes to now Denver City and Auraria. The Ute Trail was primarily used by people either from the western U.S. entering Colorado, or people in Denver City headed to Oro City and South Park. This particular trail was notorious for being a route that led newcomers to dehydration, cannibalism, and death. Most of the meals on the way to the gold fields consisted of whatever was found along the way (wild game, berries, stream water), or dried foods saved in the miners’ packs. Once the miners settled into camp, they would use the hours outside of gold panning to take advantage of the wild food sources surrounding them. Berries, herbs, and animals such as game, squirrels, bison, prairie dogs, and Colorado Bighorn sheep were hunted and trapped in the forest to be cooked over the fire later on. Since most of the miners from the gold rush were male–and because of the fact that the nineteenth century still defined cooking as a woman’s job–most of these men were forced to learn how to cook over the open fire in order to survive the mining days. As far as kindling and fuel goes, Colorado wasn’t as concentrated with as many Cottonwood trees as today, so campfires were often lit with buffalo chips: a collection of buffalo droppings harvested from the woods. Wild sage speckled the vegetation in Colorado at the time, and was also used as a form of fire fuel. And in the most desperate of circumstances, traversers sacrificed shelter and storage, burning their wooden wagons frame by frame. On top of navigating how to cook on their own food, miners had limited packing space, which meant there were very few kitchen tools available to work with. Cooking equipment for camp included a few essentials such as Dutch ovens, coffee pots, tin plates, and frying pans. Camp meals were seemingly monotonous, and oftentimes were prepared by boiling, frying, or even serving foods raw. Some of the earliest miner meals were described as being rough on digestive systems, with the day’s eats consisting of things like bacon, corn, beans, sludgy cowboy coffee, and gritty pancakes. Bean soup was a go-to, especially during bitter-cold nights. Despite a few accounts of quarrels with Native American tribes, some mining camps created relationships with Indians and traded materials for food. For the more fortunate miners, fresh pork, mutton, canned foods, and beer were occasionally found on Pike’s Peak camps as a special treat; however, these things weren’t always available. 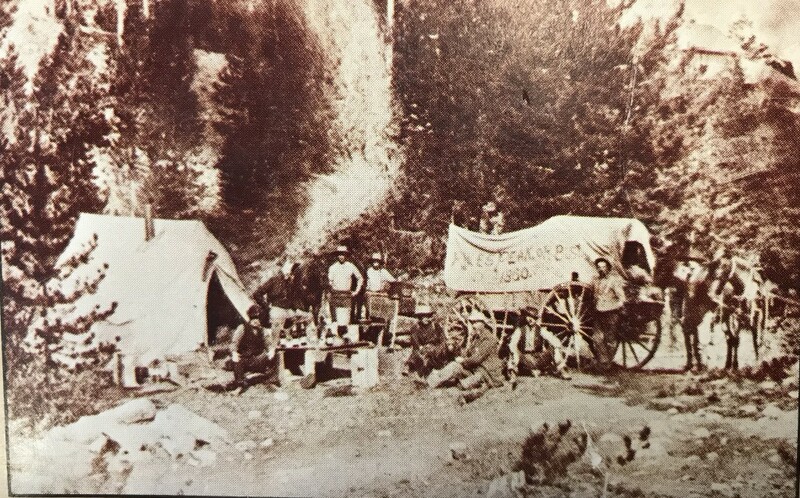 As the Colorado Gold Rush began to flourish, small little mountain towns emerged at the foothills, providing miners with general stores to load up on supplies, some of them relating to camp food–like molasses, flour, whiskey, and sugar, along with cooking equipment and other pantry items. Some things were more expensive than others; although according to Libeus Barney’s Letters of the Pike’s Peak gold rush, eggs were seemingly nonexistent and overpriced at the time of the gold rush, beef was “cheap and plentiful.” Barney’s letters also note that agriculture and horticulture in 1859 were, “sufficiently tested to guarantee a profitable return for labor,” and cereal grains and vegetables were successfully grown during the past season. This brought hope for future settlement in Colorado, as it proved to the weary newcomers that there were reliable food sources at their destination. Towards the winter of 1859, gold fields started to clear out from a lack of finds, and miners either settled into the surrounding mining towns, headed to Boulder for the more labor-intensive and less profitable quartz mining, or South Park to investigate new discoveries. During and following the Pike’s Peak Gold Rush, twenty-seven Mile Houses were sporadically built as rest stops along the trails from Leavenworth to Denver City, until the creation of the railroad made the prospect of moving to Colorado a less treacherous and more tangible dream to persue. And here we stand today, continuing to define and document our state’s rich culture. The Great Colorado Gold Rush may have only lasted a few years, but its miners camps marked a pivotal moment in Colorado food history. Abbott, C., Leonard, S., McComb, C., NetLibrary, Inc, & McComb, David G. (1994). Colorado, a history of the Centennial State (3rd ed.). Niwot, Colo.: University Press of Colorado. Barney, L. (1959). Letters of the Pike’s Peak gold rush: Or, Early day letters from Auraria. Talisman Press. Brown, R. (1985). The great Pikes Peak gold rush, Idaho: Caxton Printers.